JFA Yachts recently signed the first order for the yard’s new range of 26.25m semi-custom long range cruising catamarans, the Long Island 85. 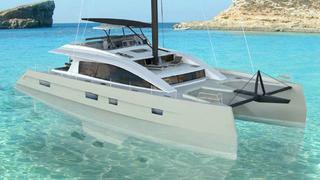 Designed by Marc Lombard, she will have aluminium hulls and a GRP superstructure. Accommodation is for six guests in three staterooms including an owner’s suite forward in the nacelle with panoramic views. The deck areas are vast and the saloon is equipped with an inside helm station, living area and bar.